Founded in 1861, the University of Washington is one of the oldest universities on the West Coast. The UW has 16 schools and colleges offering instruction in more than 100 academic disciplines by an internationally recognized faculty. The beautiful 680-acre campus is located in an attractive residential area on the shores of Lake Washington and Portage Bay, only minutes from downtown Seattle—the cultural hub of the Pacific Northwest. 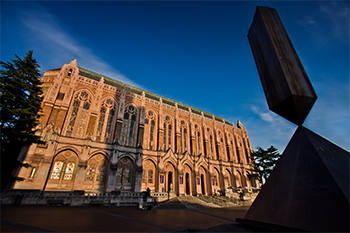 With 35,000 students, the University of Washington is one of the nation’s outstanding universities. In 2006, the UW research budget passed the $1 billion milestone. The UW research budget consistently ranks among the top 5 for both public and private institutions and is the largest recipient of federal research funding among public universities and second among all public and private universities in the US. The strong research climate contributes directly to the educational goals of graduate, undergraduate, and professional students.